Flag Act of January 13, 1794 - provided for 15 stripes and 15 stars after May 1795. 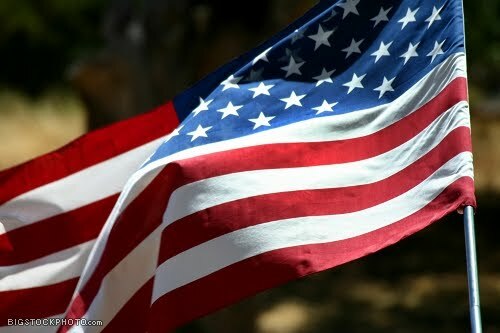 This flag was the only U.S. Flag to have more than 13 stripes. It was immortalized by Francis Scott Key during the bombardment of Fort McHenry, Sept 13, 1814. Recent changes in the law now affords all veterans the right to have at least two active military members present at a funeral. Unfortunately in most cases veterans will only get two active duty personnel in attendance. This means that full honors are not normally rendered to the departed member. The Alexandria - Pineville Veterans Honor Guard will be glad to assist active duty military personnel in rendering full honors. We will coordinate with the active duty military members to assure our departed comrades are given a dignified service. We assist by folding and presenting the flag (in the case of active duty personnel attending the flag is presented to next of kin by the active duty officer). We also fire volleys (gun salute) and play taps. If you would like to have our assistance at a funeral for a veteran please contact the funeral director handling the services or refer to our contact list. The Alexandria - Pineville Veterans Honor Guard is committed to furthering the cause of patriotism by working with local youth in learning proper flag etiquette. Working in conjunction with local schools our members teach youngster about the history, proper display and presentation of our flag. If your school is interested in having the Alexandria - Pineville Veterans Honor Guard participate in a school program please use our Request Form. 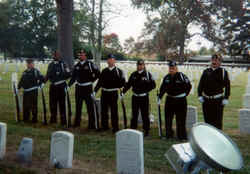 The Alexandria - Pineville Veterans Honor Guard also assists local organizations with posting of the National Colors. At the moment we are providing this service to veterans organizations, however if you would like our assistance in posting National Colors please use our Request Form.